The U.S. Justice Department will need to review approximately 47,000 cases of children who were taken into government custody at the southern border between July 2017 and June 2018 in order to attempt family reunification. 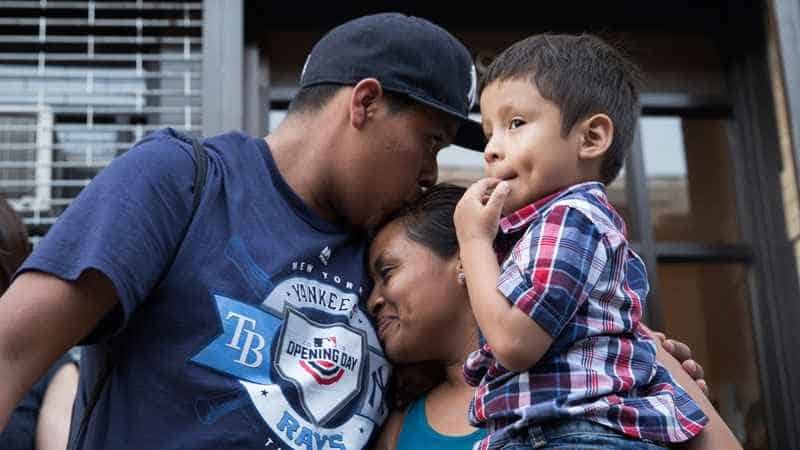 A Friday court filing revealed the Trump administration anticipates that sorting through those cases in order to reunite separated families will take at least a year. The effort is expected to be difficult since many of the children are no longer in custody of the government. A system has been developed using statistics to identify specific traits which made a child more likely to be separated, such as being under 5 or being released into the care of a non-parental custodian. Almost simultaneous to the court filing, President Trump visited the U.S. southern border where he spoke at a round-table and announced the U.S. is full, then claimed that seeking asylum is illegal immigration. Jeremy Firestone, director of the Center for Research in Wind at the University of Delaware, told ABC News that “other than hearing the president say it” he had seen nothing in peer-reviewed literature to suggest that windmills or turbines cause cancer. Republican Senator Chuck Grassley, who helped develop a wind energy tax credit in Iowa, called the president’s comments “idiotic” — and House Speaker Nancy Pelosi seconded his remarks. The president has been outspokenly opposed to windmill and turbine energy since at least 2012. He previously took legal action against the city of Aberdeenshire, Scotland for seeking to install wind turbines near his new golf course. The wind turbines were installed and last year generated enough electricity for at least three quarters of the homes in the city. A federal lawsuit filed on Friday is aimed at preventing President Trump from bypassing Congress in his attempts to construct the border wall. The U.S. House of Representatives accused Trump of “unconstitutional actions” and argued that Trump took an “extraordinary step” in announcing up to $8.1 billion would be spent on wall construction after being told by Congress $1.375 billion of the $5 billion he had requested would be appropriated for barrier construction. Trump has suggested he will be redirecting the funds from other programs without approval. The lawsuit alleges that the Trump “Administration flouted fundamental separation-of-powers principles and usurped for itself legislative power specifically vested by the Constitution in Congress”. The lawsuit argues that, being dissatisfied with the amount of money which was appropriated for border wall construction, “the Administration unilaterally determined that it would spend federal funds as it chose — not as those funds had been appropriated — instead of continuing to press its case through the proper political channels”. The House is seeking injunctive relief to prevent the president from transferring unauthorized funds. The government of the United Kingdom will be forced to request an extension from the European Union if no divorce deal is finalized by April 12 regarding Brexit, according to a bill approved by parliament this week. “Because parliament has made clear it will stop the UK leaving without a deal, we now have a stark choice: leave the European Union with a deal or do not leave at all,” British Prime Minister Theresa May was quoted following the decision. The U.K. would have been left without international trade agreements if no deal was finalized prior to departure from the E.U. This could have eventually left grocery stores empty, so many Britons began to make preparations for a no-deal Brexit — including stockpiling. According to BBC News, General Khalifa Haftar — previously appointed chief of the Libyan National Army (LNA) — ordered advancements on the Libyan capital while UN Secretary General Antonio Guterres was in the city. Prime Minister Fayez al-Sarraj accused Gen Haftar of launching a coup and said he will “be met with “nothing but strength and firmness”. Fighting — which has involved the Libyan air force — is reportedly taking place in three suburbs outside the capital currently. Many nations have joined in a call to compel both sides “to immediately halt all military activity”. The country has been unstable since leader Muammar Gaddafi was deposed and killed in 2011.